Overcoming antigenic variation is one of the major challenges in the development of an effective vaccine against Plasmodium falciparum, a causative agent of human malaria. Inclusion of multiple Ag variants in subunit vaccine candidates is one strategy that has aimed to overcome this problem for the leading blood-stage malaria vaccine targets, that is, merozoite surface protein 1 (MSP1) and apical membrane Ag 1 (AMA1). However, previous studies, utilizing malaria Ags, have concluded that inclusion of multiple allelic variants, encoding altered peptide ligands, in such a vaccine may be detrimental to both the priming and in vivo restimulation of Ag-experienced T cells. In this study, we analyze the T cell responses to two alleles of MSP1 and AMA1 induced by vaccination of malaria-naive adult volunteers with bivalent viral-vectored vaccine candidates. We show a significant bias to the 3D7/MAD20 allele compared with the Wellcome allele for the 33 kDa region of MSP1, but not for the 19 kDa fragment or the AMA1 Ag. Although this bias could be caused by “immune interference” at priming, the data do not support a significant role for “immune antagonism” during memory T cell restimulation, despite observation of the latter at a minimal epitope level in vitro. A lack of class I HLA epitopes in the Wellcome allele that are recognized by vaccinated volunteers may in fact contribute to the observed bias. We also show that controlled infection with 3D7 strain P. falciparum parasites neither boosts existing 3D7-specific T cell responses nor appears to “immune divert” cellular responses toward the Wellcome allele. The development of highly effective cross-strain immunity against infectious pathogens remains the universal goal for all vaccine developers. This is no less true in the case of the apicomplexan parasite Plasmodium falciparum, the causative agent of the most severe and deadly form of human malaria. Similar to most difficult infectious pathogens, the high level of antigenic variation and polymorphism displayed by this parasite in endemic areas frequently poses a huge challenge in the context of effective subunit vaccine development (1, 2). Ags expressed during the blood-stage parasite infection, such as merozoite surface protein 1 (MSP1) (3) and apical membrane Ag 1 (AMA1) (4), remain leading targets for inclusion in subunit vaccine candidates. These two Ags have been associated with protective immunity in naturally exposed individuals (5–7), as well as proving efficacious in preclinical vaccine studies of mice (8–10) and nonhuman primates (11–14). Although protective blood-stage immunity has been widely associated with Ab responses, a growing body of evidence in both animal and human studies supports a contributing role for cellular immunity (15, 16). Although infected erythrocytes lack MHC molecules with which to present parasite-derived peptides, it is thought that effector CD4+ T cells can enhance clearance of opsonized parasitized RBCs by macrophages in the spleen, orchestrate the induction of parasiticidal proinflammatory serum cytokine responses, and/or provide polarizing help for B cells leading to the induction of protective cytophilic IgG subclasses that may better interact with innate cellular effectors such as monocytes or neutrophils (17, 18). CD8+ T cells have been shown to be protective in the Plasmodium yoelii mouse model at both the liver stage (19, 20) and blood stage of malaria infection (21). CD8+ T cells specific for blood-stage Ags potentially target merozoite-derived Ags during the late stages of pre-erythrocytic parasite development within infected hepatocytes (20). We have thus aimed to develop clinically relevant subunit vaccine delivery platforms that are capable of inducing Ab responses against the transgene of interest in conjunction with strong cellular immunity (22, 23), and in a recent series of phase I/IIa clinical trials in Oxford, U.K., we have shown that viral-vectored delivery of the MSP1 and AMA1 blood-stage malaria Ags can achieve this goal (24, 25). In these trials, the two Ags were separately delivered utilizing a heterologous prime-boost immunization regimen consisting of a priming vaccination with a recombinant replication-deficient chimpanzee adenovirus serotype 63 (ChAd63) vector, followed 8 wk later by a boosting vaccination with an attenuated modified vaccinia virus Ankara (MVA) vector recombinant for the same Ag (Supplemental Fig. 1). This regimen was shown to be safe and immunogenic for both Ab and T cell responses in healthy adult human volunteers and, when the vectors for both Ags were coadministered, sterilizing efficacy was observed in one of nine individuals against controlled human malaria infection (CHMI) with vaccine homologous P. falciparum 3D7 strain sporozoites (26). Importantly, Abs against MSP1 and AMA1 have been shown to elicit vaccine strain–specific efficacy in nonhuman primate studies (12, 14), as well as most recently in humans in the case of a monovalent 3D7 strain AMA1 protein/adjuvant vaccine tested in Malian children (27). Attempts to address this issue of antigenic polymorphism have involved the development of multivalent vaccine formulations containing multiple allelic variants of the MSP1 or AMA1 target Ag (28–30) or artificial diversity covering consensus sequences (31). Similarly, both of the viral-vectored vaccine transgene inserts had been previously designed to address the issues surrounding target Ag polymorphism by encoding biallelic vaccine inserts for AMA1 (32, 33) and MSP1 (34, 35). Although these strategies aim to confront the difficulties surrounding the induction of cross-strain humoral immunity, other reports have raised important concerns about this approach in the context of T cell immunity (36). Such studies utilizing malaria Ags have concluded that inclusion of multiple allelic variants in a vaccine may be detrimental to both the priming and in vivo restimulation of Ag-experienced T cells (37, 38). These immunological studies arose from questions relating to the population dynamics of natural P. falciparum malaria infection, host/parasite coevolution, and how allelic dimorphisms are maintained. Although the population of P. falciparum parasite strains circulating in an endemic population will be influenced by host HLA type and other genetic factors, studies of parasite populations have also led to questions as to whether parasite strain cohabitation within hosts can affect T cell responses. A previous study has described how IFN-γ responses to allele-specific CD4+ T cell epitopes in MSP1 failed to correlate with differential antigenic exposure in The Gambia (39). 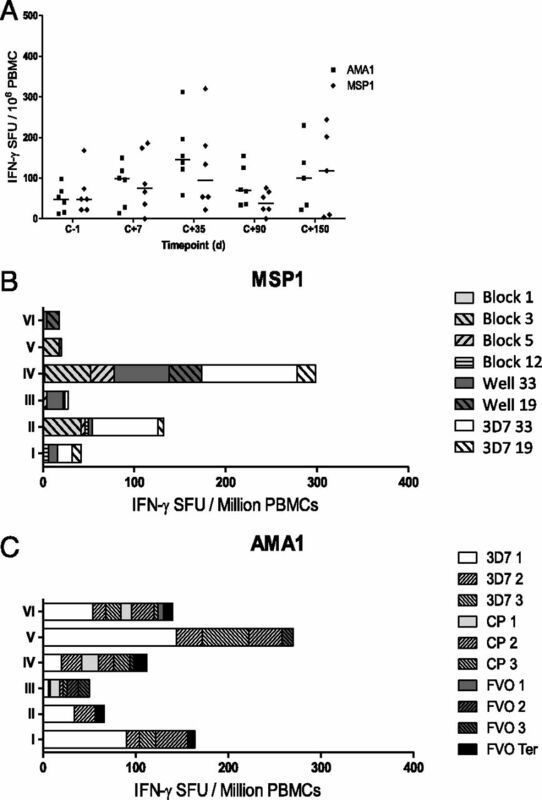 A follow-up study demonstrated that allelic altered peptide ligand (APL) T cell epitopes of MSP1 mutually inhibited IFN-γ secretion of CD4+ T cells in naturally exposed Gambian volunteers, and that the same variant epitopes were also able to impair priming of T cells from malaria-naive individuals (38). This observed effect of priming bias, termed “immune interference” (37) is dependent on the presentation of APLs on the same APC. This effect is distinguished from effector level “immune antagonism,” which describes the phenomenon whereby the simultaneous presence of an APL epitope pair causes a significantly reduced T cell recall response compared with that observed in the presence of one epitope alone, and it is not dependent on presentation of APLs on the same APC (36). Together these mechanisms could provide a significant in vivo immune evasion mechanism and thus facilitate survival of cohabiting parasites that bear such antagonistic allelic epitope regions. Gilbert et al. (36) proposed a mathematical model for cohabitation by such mechanisms and in a follow-up study (37) showed evidence for immune interference in the dimorphic CD8+ CTL epitopes, cp26 and cp29, from the liver-stage circumsporozoite protein. Moreover, they also described “immune diversion,” a mechanism whereby after priming CTLs to one epitope, exposure to the second APL variant elicited a narrow response to the original epitope and reduced cross-reactivity (37). This phenomenon is also observed in HIV (40) and hepatitis C virus infection (41). Consequently, the identification of such immune evasionary mechanisms led to the concern that attempts to address the well-recognized problem of antigenic polymorphism, by including biallelic sequences of P. falciparum Ags in the same vaccine, may be more detrimental than beneficial for both the in vivo priming and boosting of broad and effective T cell responses. Until now, there has been no bivalent blood-stage malaria vaccine tested in clinical trials that was designed to induce strong T cell responses. In this study, we analyze the vaccine-induced CD8+ and CD4+ T cell responses to both alleles of MSP1 and AMA1 delivered by the viral-vectored vaccines in malaria-naive adult volunteers. We show that although there is a significant bias toward the 3D7/MAD20 allele (over the Wellcome allele) in terms of T cell responses to the dimorphic 33 kDa region of MSP1 (MSP133), this is not observed for the 19 kDa region of MSP1 (MSP119) or for the AMA1 Ag. Although the bias to a stronger 3D7 allele MSP133-specific response could be due to immune interference, we offer an alternative explanation that limited recognition of class I HLA epitopes in the Wellcome allele may result in similar observations. We also confirm that immune antagonism does occur at the minimal epitope level in vitro, as previously shown for the MSP1 Ag (38, 39), but we conclude that these effects were too small to influence the overall Ag-specific responses as measured by ex vivo IFN-γ ELISPOT assay. Similarly, exposure of volunteers to infectious challenge with 3D7 strain P. falciparum parasites does not appear to “immune divert” cellular responses toward the Wellcome allele, although interestingly we also observed no apparent boosting of responses after exposure. Overall, the data suggest that host HLA type may play a prominent role in determining the magnitude of measured T cell responses to different alleles within these bivalent blood-stage malaria vaccine candidates and should be taken into consideration for immunomonitoring in future studies. Frozen PBMC samples were used throughout this study and were obtained from phase Ia safety and immunogenicity clinical trials for the MSP1 (24) and AMA1 (25) candidate vaccines, as well as a phase IIa efficacy study where immunized volunteers underwent CHMI with vaccine homologous P. falciparum 3D7 strain sporozoites delivered by mosquito bite (Supplemental Fig. 1) (26). In all cases, the two Ags were separately delivered by a heterologous prime-boost immunization regimen consisting of a priming i.m. vaccination with a recombinant replication-deficient ChAd63 vector (doses, 5 × 109 to 5 × 1010 viral particles), followed 8 wk later by a boosting vaccination i.m. with MVA vector (doses, 1.25–5 × 108 PFU) recombinant for the same Ag. All necessary regulatory and ethical approvals were granted as previously described (24–26), and the trials were registered with ClinicalTrials.gov. All volunteers gave written informed consent prior to participation, and the studies were conducted according to the principles of the Declaration of Helsinki and in accordance with Good Clinical Practice. All volunteers participating in these clinical trials gave permission for samples to be used for exploratory immunology analysis and HLA typing (Transplant, Immunology, and Immunogenetics Department, Churchill Hospital, Oxford National Health Service, Oxford, U.K.). PBMC samples from the trials were all prepared and frozen as previously described (24). The composition of the biallelic vaccine inserts for MSP1 (34, 35) and AMA1 (32, 33) used in both the ChAd63 and MVA vaccine vectors have been previously described. In the case of AMA1, a bivalent transgene was optimized to consist of the 3D7 and FVO strain alleles fused in tandem, whereas for MSP1 an insert was designed comprising both the 3D7/MAD20 and Wellcome alleles of the dimorphic 42-kDa C-terminal region (MSP142/sequence blocks 16 and 17) fused in tandem and preceded by the naturally conserved regions of MSP1 sequence (blocks 1, 3, 5, and 12) (35). The MSP142 region is composed of an N-terminal 33-kDa region (MSP133, block 16) followed by a C-terminal 19-kDa region (MSP119, block 17). Peptides were designed as 20-mer overlapping by 10 aa to cover the entire sequence of each transgene insert, and they were pooled according to sequence block for the MSP1 insert or by whether they were 3D7 allele-specific, FVO allele-specific, or common to both in the case of AMA1, all as previously described (24, 25). All new peptides used for the studies here are listed in Table I. The epitope prediction software SBS EpiToolKit (http://www.epitoolkit.org/epipred) was used to select the minimal epitopes described in Table II. All new peptides were purchased from Peptide Protein Research (Fareham, U.K.) at a purity of >75%. Peptides were reconstituted in 100% DMSO at 100–200 mg/ml and then used to create working peptide pool stocks of 10 μg/ml for ELISPOT assay (2× final concentration). The ex vivo IFN-γ ELISPOT was performed as previously described (24, 25). However, instead of using freshly isolated cells, frozen PBMCs were thawed in a water bath at 37°C and immediately transferred into warm medium. Cells were washed twice in medium before incubation in medium containing 1 μl/ml Benzonase (25 U/μl; Sigma-Aldrich) for a minimum of 1 h, then counted and resuspended at 5 × 106 cells/ml. Cells (50 μl) were added to the relevant wells of the ELISPOT plate to give 250,000 cells per well. Cells were restimulated in duplicate with 50 μl relevant peptide(s) (final concentration 5 μg/ml each peptide), with a media/DMSO unstimulated negative control and a PHA/staphylococcal enterotoxin B positive control before incubation and development, all as previously described (24, 25). Results are expressed as IFN-γ spot-forming units (SFU) per million PBMCs. Background responses in unstimulated control wells were almost always <20 spots and were subtracted from those measured in peptide-stimulated wells. CD4+ and CD8+ T cell depletions were performed according to the manufacturer’s instructions for the MACS magnetic column system, with human CD4 and CD8 microbeads (Miltenyi Biotec, Bisley, U.K.). 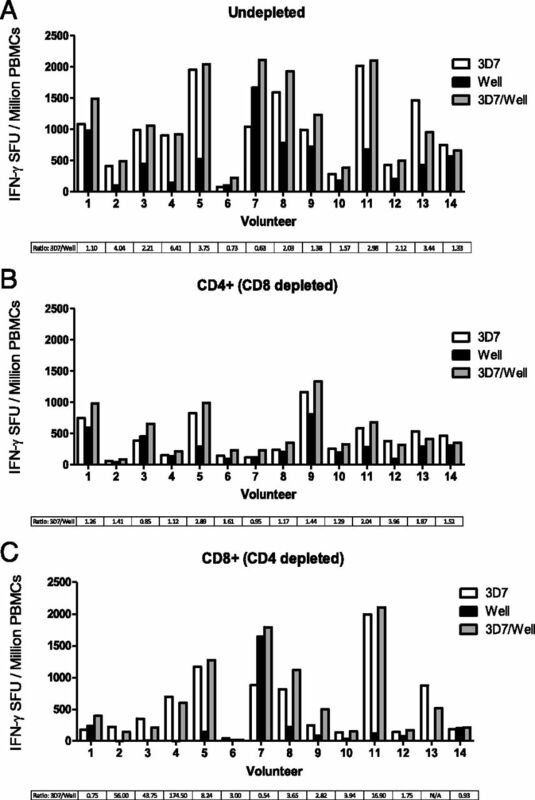 Typically 10 million PBMCs were thawed as previously described and divided equally to generate three samples (∼3 million cells/sample after losses): 1) undepleted, 2) CD4+ cells (CD8+ cell-depleted), and 3) CD8+ cells (CD4+ cell-depleted). Microbeads were added to specifically bind to the fraction intended for depletion and then incubated before application to the magnetic column. Labeled (unwanted) cells are attracted to the magnetic field trapping them within the column while the remaining cells pass through. The flow-through fraction was then resuspended to the original volume and a standard ex vivo IFN-γ ELISPOT assay performed, whereas the depleted cells were discarded. A subset of samples was also analyzed by flow cytometry to assess the efficiency of depletion. Cells were extracellularly stained using anti-human CD3-FITC (clone UCHT1), anti-human CD4-PerCP-Cy5 (clone OKT4), and anti-human CD8α-allophycocyanin (clone RPA-T8) Abs (eBioscience) before analysis using an LSRII flow cytometer (BD Biosciences, Franklin Lakes, NJ). Cells were gated by lymphocytes/singlets/CD3+ cells before gating on CD4+ and CD8+ cells. Depletion efficiency was >98% for CD4+ and >99% for CD8+ cells (Supplemental Fig. 2). Data were analyzed using GraphPad Prism version 5.03 for Windows (GraphPad Software, San Diego, CA). Wilcoxon matched-pairs signed-rank tests were carried out to compare responses to pairs of alleles. A p value >0.05 was considered significant in all cases. Previous data have suggested that cohabiting P. falciparum parasites could interfere with the priming of T cell responses by the phenomenon of immune interference as well as restimulation of memory responses by immune antagonism, whereby APL epitopes present in dimorphic Ags antagonize responses to each other (38). This led to concerns about the ability to prime and boost cellular immune responses with vaccines encoding more than one allele of an Ag. In this study, healthy malaria-naive adult volunteers were immunized in a heterologous prime-boost immunization regimen with viral-vectored vaccines encoding biallelic inserts for the MSP142 or AMA1 blood-stage malaria Ags (Supplemental Fig. 1). Initially, total IFN-γ–producing T cell responses were assessed to each allele by ex vivo IFN-γ ELISPOT assay. AMA1-specific responses were calculated by summing the response to pools containing peptides unique to each individual allele (3D7 or FVO) with the response to pools containing peptides that were conserved between the two alleles. We have previously reported that the responses at the peak time points (day 14 after the ChAd63 prime and day 63 after the MVA boost) are broad and spread over each of the 10 peptide pools assayed (25); however, the C-terminal domain (also included in the vaccine construct and unique to the FVO sequence) (32, 33) was excluded from the analysis reported in this study. Fig. 1A shows the allele-specific responses for all time points assayed in the phase Ia study. There were no significant differences between overall responses to the 3D7 or FVO alleles of AMA1 by a Wilcoxon matched-pairs signed-rank test at all time points measured, including those measured after the ChAd63 prime (day 0 to day 56) and after the MVA boost (day 63 to day 140). Comparison of allele-specific IFN-γ T cell responses to 3D7 (○) and FVO/Wellcome (▴) AMA1 and MSP1 in volunteers at key time points during two independent phase Ia clinical trials of biallelic AMA1 and MSP1 vaccines. Graphs represent the individual response and group median for T cell responses, expressed as IFN-γ SFU/106 PBMCs summed from pools containing overlapping peptides from the vaccine insert. (A) AMA1 allele-specific responses calculated by adding the allele-specific response (3D7 or FVO) to the common pool response for each individual. MSP133 (B) and MSP119 (C) fragment–specific responses for each allele (3D7 or Wellcome) calculated by adding responses from relevant peptide pools. Day 0 calculations are excluded from statistical analysis. Ratios for the two median responses are also included (>1 indicates stronger 3D7 response). *p < 0.05, **p < 0.01. MSP1 allele-specific IFN-γ T cell responses were also calculated by summing the response to pools containing peptides specific to each individual allele (3D7 or Wellcome) of MSP133 and MSP119 contained within the vaccine Ag. Similar to AMA1, we have also previously reported that the responses at the peak time points (day 14 after the ChAd63 prime and day 63 after the MVA boost) are broad and spread over each of the 12 peptide pools assayed (24). In this study, we show the allele-specific responses for all time points assayed in the phase Ia study for both MSP133 (Fig. 1B) and MSP119 (Fig. 1C). In the case of the MSP133 region, significant differences were observed between the responses to the 3D7 and Wellcome alleles in a Wilcoxon matched-pairs signed-rank test for all time points after the priming and boosting vaccinations except days 0 and 56, with 3D7 being the dominant allele as reflected in the 3D7/Wellcome ratio. At the peak response postprime (day 14) and postboost (day 63) the differences were most significant. Responses to MSP119, however, were comparable between the two alleles, with no significant differences observed. Note that the MSP119 3D7 pool contains three more peptides than its Wellcome equivalent (24). These three peptide sequences are duplicated in the Wellcome sequence and therefore were excluded in the second pool to avoid duplication of the response. It is highly unlikely that these peptides contain strong epitopes given the lack of significant differences between the responses to the two pools. These responses to MSP119 were also of much weaker magnitude in comparison with MSP133 (in agreement with the smaller size of this domain) but were not absent, as might be expected from preclinical data suggesting that this conformational region of MSP1 (34) is refractory to Ag processing and presentation to T cells (42, 43). Overall, these data confirm that it is possible to both prime and boost T cell responses to each component allele encoded in the biallelic vaccines, and only in the case of MSP133 was a dominant allele noted. Previous data from studies of malaria, hepatitis C virus, and HIV have also described the phenomenon of immune diversion, a mechanism whereby after priming to one epitope, exposure to a second APL variant elicited a narrow response to the original epitope and reduced cross-reactivity. We explored this effect in the context of a CHMI study, whereby immunized volunteers were experimentally exposed to five mosquito bites harboring infectious 3D7 clone P. falciparum sporozoites (26, 44). All of the volunteers immunized with the MSP1 or AMA1 vaccines alone developed blood-stage malaria infection and were treated at the time of patency as diagnosed by thin blood film microscopy (26). Volunteers had thus been immunized with biallelic T cell–inducing vaccines followed by subsequent exposure to a single malaria parasite clone (3D7 in this case). Total IFN-γ–producing T cell responses were again assessed to each allele by ex vivo ELISPOT assay before and after malaria exposure. As before, the allele-specific responses are shown for all time points assayed in the phase IIa efficacy study (Fig. 2). In contrast to the phase Ia trial (Fig. 1A), small but significant differences were observed between the 3D7 and FVO AMA1-specific responses by Wilcoxon matched-pairs signed-rank test after the ChAd63 prime (day 0 to day 56), although this difference was less pronounced following MVA boost and prior to malaria infection (day 63 to day 1 preceding CHMI [dC−1]) (Fig. 2A). Following malaria sporozoite infection, blood-stage merozoites are predicted to rupture out of the liver and enter the blood on days 6.5–7 postchallenge (dC+6.5 and dC+7). Median time to patent parasitemia was 10.8 d for both MSP1- and AMA1-vaccinated volunteers compared with 9.7 for the controls (26). Whereas PBMC samples assayed up to 150 d postchallenge (dC+150) showed some small but significant differences between the 3D7 and FVO allele-specific responses, there was no significant boosting of 3D7 AMA1-specific T cell responses. Overall, the median ratio of responses between 3D7 and FVO AMA1 remained close to 1, and the significant differences observed were primarily due to the paired analysis and slightly stronger 3D7 responses in the case of most individuals. Comparison of allele-specific IFN-γ T cell responses to 3D7 (○) and FVO/Wellcome (▴) AMA1 and MSP1 in volunteers at key time points during a phase IIa clinical trial of biallelic AMA1 and MSP1 vaccines. Volunteers underwent CHMI ∼16 d after boosting vaccination. Graphs represent the individual response and group median for T cell responses, expressed as IFN-γ SFU/106 PBMCs summed from pools containing overlapping peptides from the vaccine insert. (A) AMA1 allele-specific responses calculated by adding the allele-specific response (3D7 or FVO) to the common pool response for each individual. MSP133 (B) and MSP119 (C) fragment–specific responses for each allele (3D7 or Wellcome) calculated by adding responses from representative pools. Day 0 calculations are excluded from statistical analysis. Ratios for the two median responses are also included (>1 indicates stronger 3D7 response). *p < 0.05, **p < 0.01. In agreement with AMA1, very similar results were observed for the dimorphic MSP133 and MSP119 responses (Fig. 2B, 2C). Comparable results were observed to the phase Ia clinical trial data prior to malaria infection, and following challenge the ratio of 3D7 and Wellcome responses for MSP133 were not affected. There was no significant boosting of 3D7 allele responses and no apparent diversion toward Wellcome-specific responses. Although the dominance of the 3D7 MSP133 allele does become significantly greater at the dC+7 and dC+35 time points, this significance level is also observed at dC−1 and is less pronounced at dC+90 and dC+150. For MSP119 there was also no change to the 3D7/Wellcome ratios toward a 3D7 bias after challenge except for dC+35 where there was a small but significant enhancement of the 3D7-specific response. Overall, these data suggest that controlled 3D7 clone blood-stage parasite exposure does not boost the IFN-γ T cell response induced by the vaccine, nor is there significant diversion of responses toward the noninfecting heterologous allele. In the phase IIa efficacy study, six malaria-naive infectivity control volunteers were also infected, and responses against MSP1 and AMA1 were assessed by ex vivo IFN-γ ELISPOT postinfection (Fig. 3). An acute blood-stage exposure induced low-level responses against both Ags, peaking at dC+35 (Fig. 3A). Analysis of the breakdown of the responses to the MSP1 Ag (dC+35 after subtracting background at dC−1) showed that infection induced T cells reactive to the conserved blocks of MSP1 sequence, in particular block 3 in three of six volunteers, as well as responses to the 3D7 MSP142 region in three of six volunteers (Fig. 3B). Four out of six volunteers also showed detectable responses to the Wellcome strain peptide pools, most notably for the MSP133 region. In contrast, for the AMA1 Ag, the vast majority of the T cell response was to unique 3D7-specific peptide pools along with some to the conserved peptides (Fig. 3C), whereas those to the FVO-specific peptide pools were negative or extremely low. The potential for the induction of cross-reactive T cell responses following 3D7 clone parasite infection thus appears to be more common for MSP133 than AMA1. Given that MSP133 3D7 and Wellcome only share 51% similarity, in comparison with 95% similarity between 3D7 and FVO in AMA1, it appears that natural exposure may favor the induction of AMA1 strain–specific T cell responses. This is in strong contrast to vaccination with the biallelic AMA1 vaccine, where comparable T cell responses were observed to both the strain-specific and common peptides (25). CHMI induces allele-specific responses in unvaccinated control volunteers in a phase IIa efficacy study. (A) The total Ag-specific IFN-γ T cell response peaks 35 d after CHMI (dC+35). Peak response breakdown to individual pools for MSP1 (B) and AMA1 (C) following 3D7 challenge, calculated by subtracting baseline response before CHMI (dC−1) from response 35 d after CHMI (dC+35), is shown. Pools can be identified as containing conserved sequences (light gray), 3D7-specific sequences (white), Wellcome/FVO–specific sequences (dark gray), or FVO AMA1 C-terminal region sequences (black). The previous analyses assessed overall IFN-γ T cell responses by ELISPOT assay and indicated that following secondary immunization there was no apparent immune antagonism that prevented boosting of T cell responses to both alleles of the vaccine Ag. However, it remained possible that more subtle effects would occur at the epitope-specific level or within the CD4+ or CD8+ T cell subsets. Lee et al. (38, 39) have previously reported HLA class II APL antagonistic epitope pairs within dimorphic regions of MSP1, and one pair of epitopes (M7/8) reported by Lee et al. were also contained within the MSP133 region of the vaccine construct (Table I). Immune antagonism was assessed in vitro in the same manner as Lee et al. by ex vivo IFN-γ ELISPOT assay using peptides either alone or combined to restimulate PBMCs from the day 63 time point (peak response). Using this pair of minimal epitopes, referred to here as M7* and M8*, we identified seven volunteers who responded significantly to at least one of the epitopes (Fig. 4A), indicating that responses had been induced in vivo by vaccination to these epitopes and not completely prevented owing to immune interference or antagonism. In their studies, Lee et al. (38) described antagonism as an arbitrary ≥30% reduction in the response following restimulation with both peptides. To increase stringency we increased the cut-off to a ≥50% reduction. IFN-γ T cell responses in MSP1-vaccinated volunteers at day 63 to single peptides from allelic pairs both individually and combined in a single pool: (A) M7*/M8* 8-mer, (C) M92/M53 20-mer, (E) M7*/M53, (G) M92/M8*, and (I) M85/M48 20-mer. 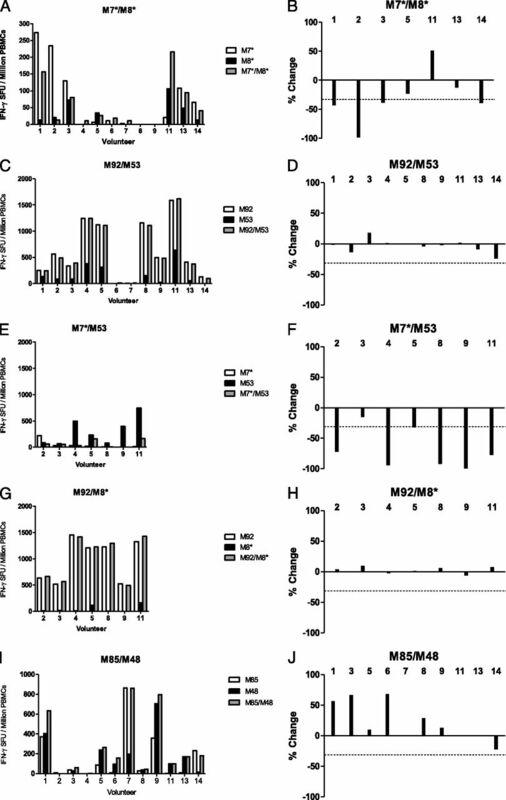 In the right panels, bars shows percentage change from the strongest single allele peptide response to the response to the pool containing both peptides: (B) M7*/M8* 8-mer, (D) M92/M53 20-mer, (F) M7*/M53, (H) M92/M8*, and (J) M85/M48 20-mer. Antagonism is defined as a ≥50% reduction (signified by dotted line) from the IFN-γ response measured to a single peptide compared with when that peptide is combined with its opposing allele. Two volunteers (nos. 10 and 12) are not included in this analysis owing to limited day 63 PBMC availability, but they are included in later analyses. Only 7 of 12 volunteers were tested for (E)–(H) owing to limited availability of day 63 PBMC samples. Responses are measured in duplicate, averaged, and background subtracted. Of the individuals tested, only one volunteer (no. 2) showed almost complete antagonism (98% reduction) whereas three volunteers fell just short of the 50% cut-off (Fig. 4B). Note that a single amino acid difference does exist between the sequence for M8* and that found in the vaccine Ag sequence (V–Y substitution at the final position of M8*), although vaccinated volunteers still responded to the M8* peptide restimulation, indicating the final amino acid may not be critical for HLA class II molecule binding. When we performed the same experiment using 20-mer peptides (routinely used in the clinical assays) that contain the M7/8 minimal epitopes (referred to here as M92 and M53; Table I) (24), we observed a different result. Ten of 12 volunteers responded to the extended peptides (Fig. 4C), possibly indicating the presence of other epitopes within the extended peptides (e.g., volunteer nos. 4, 5, 8, 9, and 11 responded more strongly in the assay than when using the minimal peptides). However, none of these samples, including volunteer no. 2, showed antagonism in vitro, and in most cases the combined M92/M53 pool roughly equaled the response seen with the M92 pool alone (Fig. 4D). These data suggest that the 20-mer peptides may be detecting responses to alternative epitopes that are not antagonized, or that the 20-mer is not sufficiently processed into the minimal antagonistic APL. To address this, we next tested each minimal epitope with its heterologous 20-mer. Volunteer no. 2, who had the notable M7* response, was again antagonized in the presence of M53, in agreement with the observation in Fig. 4A and suggesting that the 20-mer peptide M53 can be processed into an antagonistic APL (Fig. 4E, 4F). We also observed volunteers (nos. 4, 5, 8, 9, and 11) who responded better to M53 (Fig. 4C, 4E) than to M8* (Fig. 4A), suggesting either the presence of another epitope or that the optimal HLA binding sequence in fact contains flanking amino acids only present in the 20-mer peptide. In agreement with the latter, these responses were all highly antagonized in the presence of M7* peptide (Fig. 4F), greatly exceeding the ≥50% cut-off. The opposite experiment, testing peptide M92 with M8*, confirmed the absence of responses to M8* but improved responsiveness to the M92 twenty-mer in comparison with M7* (Fig. 4G), suggesting the presence of another epitope. In agreement with this, these responses were not antagonized in the presence of M8* peptide (Fig. 4H). We also tested a combination of two 20-mer peptides, M85 and M48, which contained the dimorphic minimal epitopes M30 and M31 shown by Lee et al. (39) to be immunogenic but not previously tested for antagonism. In this case, 10 of 12 volunteers responded to these peptides (Fig. 4I) with none displaying antagonism (Fig. 4J). In fact, for 3 of 12 volunteers, restimulation with both peptides gave an additive effect (>50% increase) in comparison with the single-peptide responses. Overall, these data confirm that it is possible to observe immune antagonism in vitro between APL variants; however, these differences can be subtle and only observed when using specific peptide sequences. We further speculated that the previous observations of antagonism could be specific to the M7/8 epitope pair alone. Therefore, to confirm whether an effect of immune antagonism in vitro could be detected to the vaccine Ag overall, we performed similar experiments using pools of 20-mer peptides spanning the whole MSP133 regions. As before, pools representing the 3D7 and Wellcome alleles were tested alone or in combination using PBMCs from the peak time point following the MVA booster immunization (day 63). All 12 volunteers responded (Fig. 5A) and only one (volunteer no. 3) showed moderate antagonism of 45% that approached the arbitrary cut-off (Fig. 5B). AMA1 was also tested in the same format using pools of peptides unique for the 3D7 and FVO alleles and PBMCs from AMA1-vaccinated volunteers. No antagonism was observed, and for five of eight volunteers the ratios of the 3D7/FVO responses were roughly even, and only one volunteer (no. 5) displayed a bias toward the 3D7 allele (Fig. 5C, 5D). IFN-γ T cell responses were measured against allele-specific pools both individually and combined for MSP133 3D7/Wellcome (Well) (A) and AMA1 3D7/FVO (C). 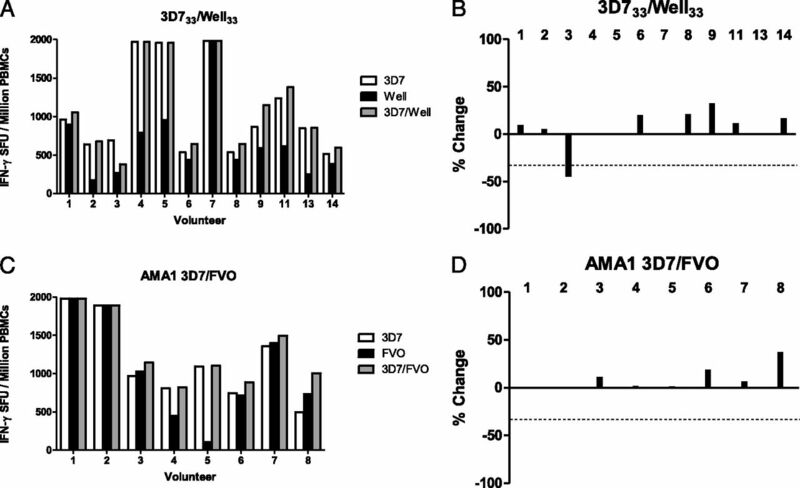 In the right panels, bars shows percentage change from the strongest single allele peptide pool response to the response to the combined pool containing allelic peptides: MSP133 3D7/Well (B) and AMA1 3D7/FVO (D). Antagonism is defined as a ≥50% reduction (signified by dotted line) from the IFN-γ response measured to a single peptide compared with when that peptide is combined with its opposing allele. Two volunteers (nos. 10 and 12) are not included in this analysis owing to limited day 63 PBMC availability, but they are included in later analyses. Responses are measured in duplicate, averaged, and background subtracted. We had so far only observed immune antagonism in vitro when testing a previously described minimal HLA class II epitope from MSP133 (38). Immune antagonism has been reported for both HLA class I and class II malaria epitopes (37, 38), and we therefore also assessed whether we could observe this effect in either the CD4+ or CD8+ T cell subsets. Frozen PBMCs from 14 volunteers who had received the MSP1 immunization regimen were used for CD4+ and CD8+ T cell depletion studies. PBMC samples showing strong immunogenicity at various time points, and for which frozen cells were available (Supplemental Fig. 3), were selected and depleted of the relevant T cell subset before performing the ELISPOT assays as before using the same MSP133 peptide pools. T cell depletion efficiency was confirmed by flow cytometric analysis (as described in Materials and Methods) in four of the volunteers and was shown to be >98% efficient (Supplemental Fig. 2). Undepleted cells (Fig. 6A) showed comparable responses to those seen previously (Fig. 5A). Volunteer no. 3, who previously displayed some evidence of antagonism at the day 63 time point, no longer showed this effect when using PBMCs from day 84. Only 1 of 14 volunteers (no. 7) showed a stronger response to the Wellcome allele, with the remaining 13 showing a stronger 3D7 response, in agreement with the previous result (Figs. 1B, 2B). When the same assay was performed with CD4+ (CD8+-depleted) T cells, the results showed roughly even 3D7/Wellcome responses for 7 of 14 volunteers, with the remainder still having stronger 3D7 allele-specific responses (Fig. 6B). Moreover, no evidence of in vitro antagonism was observed. The results for the CD8+ (CD4+-depleted) T cells showed that most volunteers had high 3D7 responses and low to negligible Wellcome allele responses (Fig. 6C). Two volunteers (nos. 1 and 14) displayed low responses but a roughly equal 3D7/Wellcome ratio, whereas a third volunteer (no. 7) showed a strong, dominant Wellcome response. There was also no in vitro antagonism observed for these CD8+ T cell responses. Taken together, these data indicated that the previously observed dominance of the 3D7 MSP133 response over the Wellcome MSP133 response is possibly due to an apparently low CD8+ T cell response against the Wellcome allele sequence. IFN-γ T cell subset responses in MSP1-vaccinated volunteers against peptide pools containing either MSP133 3D7 peptides, MSP133 Wellcome peptides, or a combined pool of both allelic peptides. To compare IFN-γ responses from different T cell subsets undepleted PBMCs (A), CD4+ (CD8+-depleted) PBMCs (B), and CD8+ (CD4+-depleted) PBMCs (C) were prepared using an MACS magnetic column depletion kit and responses to peptide pools were measured. Graphs represent the individual responses expressed as IFN-γ SFU/106 PBMCs from various time points selected for high responses and PBMC availability (nos. 10 and 12, day 14; nos. 1, 9, and 14, day 63; nos. 2, 3, 4, 8, and 11, day 84; no. 5, dC−1; no. 13, dC+35; no. 7, dC+90; no. 6, day 140; see Supplemental Fig. 3). Ratios for the 3D7/Well median response are included (>1 indicates stronger 3D7 response). We decided to further investigate why only a small subset of volunteers produces a CD8+ T cell response to the Wellcome allele of MSP133. Volunteers are HLA typed routinely as part of the clinical trial program, and review of these data identified that volunteer nos. 1 and 14, both of which showed 3D7/Wellcome MSP133 ratios <1 (indicating a stronger Wellcome response) were heterozygous for HLA-B*1801. Moreover, volunteer no. 7, who showed a much stronger Wellcome allele-specific response (as compared with 3D7), was found to be homozygous for this same HLA type. To test for HLA-B*1801–specific CD8+ T cell minimal epitopes, we ran the Wellcome MSP133 vaccine sequence through the epitope prediction software SBS EpiToolKit for HLA-B*1801 as well as other common HLA-B types displayed in the volunteer population. Initially we analyzed the routine trial ELISPOT assay readout for volunteers, where the total responses to Wellcome MSP133 are measured using three peptide pools (24). A breakdown of responses in these volunteers revealed a dominance of responses in the 33a pool, which contains the 10 N-terminal peptides. This was most noticeable in volunteer no. 7 in whom 92% of the total Wellcome MSP133 response was observed against peptides in pool 33a. A summary of individual responses to the Well33a pool over time is shown in Supplemental Fig. 3. In agreement with this, the prediction software for HLA-B*1801 predicted a large number of epitopes in this pool that were not present in the 3D7 sequence. Several epitopes for other common HLA-B types were also predicted for sequences in the 33a pool, many overlapping with the sequences predicted for HLA-B*1801. Based on this observation 12 minimal epitopes were selected based on strongly predicted HLA association, broad coverage of HLA types, and no homology with the 3D7 sequence (Table II). These were then tested in a CD8+ (CD4+-depleted) T cell ELISPOT assay. Of the 12 epitopes, 3 were found to give strong positive responses in volunteer nos. 1, 7, and 14, with volunteer no. 7 displaying the strongest response as would be predicted for this HLA-B*1801 homozygote individual (Fig. 7A). All other volunteers gave essentially negative responses with no individual peptide response >15 SFU/million PBMCs. To confirm this observation, we tested the CD8+ T cell response in volunteer no. 7 using the equivalent 20-mer peptides (used in the routine trial assays) containing the predicted epitopes Well33a2-6 (Fig. 7B). Results indicated a strong response to both 20-mer (M39 and M40)–containing epitope Well33a5 and the 20-mer (M37)–containing epitopes Well33a2, 3, and 4 (see Table II). 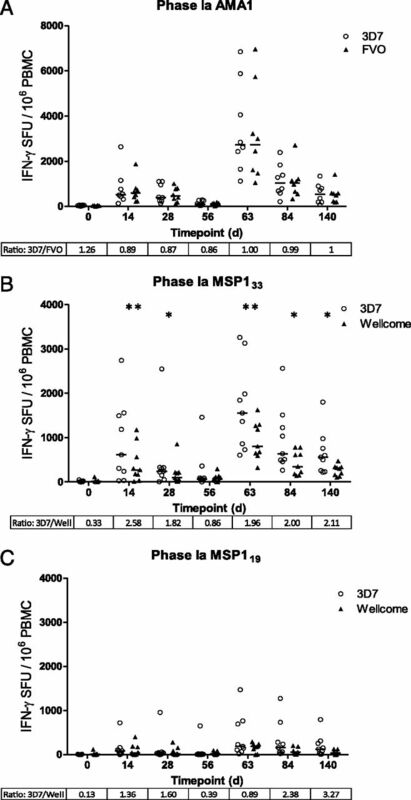 Overall, these results suggest that the strong response to Wellcome MSP133 in HLA-B*1801 volunteers is primarily due to a number of HLA class I epitopes, situated toward the N terminus of the MSP133 sequence (Fig. 7C), and this may account for weaker Wellcome MSP133 responses in volunteers lacking this HLA-B class I allele. (A) IFN-γ CD8+ T cell responses to predicted minimal epitopes from the MSP133 Wellcome allele. Volunteers and time points tested are equivalent to those in Fig. 6. HLA-B*1801 is heterozygous in volunteer nos. 1 and 14 and homozygous in volunteer no. 7. Complete epitope sequences, predicted HLA associations, and equivalent trial peptide locations for all minimal epitopes can be found in Table II. (B) IFN-γ CD8+ T cell responses from volunteer no. 7 to 20-mer peptides containing minimal epitopes recognized previously. (C) Location of CD8+ T cell minimal epitopes recognized by volunteers with HLA-B*1801. Epitopes are located toward the N terminus of the Wellcome MSP133 fragment. We have developed viral-vectored blood-malaria vaccine candidates that encode biallelic transgene inserts for the MSP1 and AMA1 Ags. These vaccines were developed with the aim of providing a broad immunological response that can protect against multiple strains of P. falciparum. The use of a ChAd63 vector to prime responses followed by a boost with MVA 8 wk later has been shown to induce high levels of T cells and substantial Ab responses in both animal models and phase I/IIa clinical trials in humans for both blood-stage vaccine candidate Ags (8, 24, 25). However, previous studies have raised concerns that inclusion of multiple allelic variants in a vaccine may be detrimental to both the priming and in vivo restimulation of Ag-experienced memory T cells owing to the immune evasion effects of antagonistic APLs present in polymorphic Ags. In this study, we explored the concepts of immune interference, antagonism, and diversion of IFN-γ T cell responses in the context of human vaccination with viral-vectored vaccines and subsequent malaria exposure following a phase IIa CHMI study. Previous studies have suggested that dimorphic malaria Ag variants arose and were maintained in parasite populations due to a survival advantage in the context of parasite cohabitation within the human host. MSP1 allelic T cell responses failed to correlate with differential Ag exposure in The Gambia (39), and associated with this observation was the inference from in vitro studies that cohabiting P. falciparum parasites could interfere with the priming of T cell responses by the phenomenon of immune interference, and that the same would be true for restimulation of memory responses by immune antagonism (38). Such immune evasion mechanisms could be achieved by APL epitopes from both HLA class I and class II molecules present in dimorphic Ags leading to antagonism of responses (36–38). Ultimately, concerns were raised about the ability to prime and boost cellular immune responses with vaccines encoding more than one allele of an Ag. Until now, these concerns could not be fully explored in the context of human vaccination owing to the lack of biallelic malaria vaccine candidates that are capable of inducing strong cellular immune responses in human volunteers. In this study, we investigated these effects following human vaccination with the ChAd63-MVA viral-vectored vaccine platform, one that has been optimized for the induction of both humoral and cellular immunity (22, 23). Initially we investigated the priming and boosting of T cell responses using the ex vivo IFN-γ ELISPOT assay. T cell responses, as measured against the 3D7 and FVO alleles of AMA1, appeared to be primed and boosted consistently, and the ratio of the responses was roughly equal and also stable throughout the monitoring period. Similar results were obtained for the MSP119 region of MSP1. In agreement with this, the two alleles of AMA1 (as encoded in the vaccine) differ by 24 amino acids and the ectodomains share 95% sequence identity; similarly, MSP119 shows 96% amino acid conservation between the 3D7 and Wellcome alleles. In contrast, the MSP133 fragment only shows 51% amino acid conservation between the two, and in this case responses toward the 3D7 allele were dominant over the Wellcome allele in most volunteers. This was apparent after priming and was maintained after boosting and throughout the memory phase. In the absence of a control GMP-grade vaccine encoding a single allele that could be used for human vaccination, it remains impossible to establish whether responses against APL variants could display interference/antagonism at the priming and/or boosting phase, thus leading to reduced responses in the presence of both variants compared with the presence of one. However, the data clearly establish that strong and detectable IFN-γ T cell responses can be primed and boosted by immunization against both component alleles, and this was independently observed in two clinical trials of the same vaccines. The observation of strong cellular responses against the MSP133 region (in comparison with MSP119) is in good agreement with many previous studies that have assessed T cell recognition within MSP142 in both animal models (20, 45) and humans (46–49). Note also that future studies could further assess such phenomena in the context of other T cell phenotype readouts, including different cytokine production. We next assessed the potential effects of single-strain blood-stage malaria parasite exposure on vaccine-induced T cells responses. In this case, 3D7 clone parasites were used to assess vaccine efficacy, following immunization with the biallelic vaccines (26). In this experimental context, restimulation of heterologous epitope-specific T cell responses (Wellcome allele in the case of MSP142 or FVO allele in the case of AMA1) by antagonistic APLs from the 3D7 clone sequence could occur in conjunction with restimulation of the homologous 3D7 responses. No significant boosting was observed to either allele of either Ag during natural in vivo infection by 3D7 clone blood-stage malaria parasites. In all cases, IFN-γ T cell responses after malaria challenge continued to contract into the memory phase with similar kinetics to those observed in the phase Ia trials where volunteers were not experimentally infected. It remains possible that the lack of boosting is due to a form of immune diversion; however, in the absence of a single allele comparator clinical-grade vaccine, we cannot confirm that responses were curtailed in such a manner. Interestingly, despite any apparent boosting of vaccine-induced T cell responses, de novo T cell responses were observed against both MSP1 and AMA1 in control volunteers who had not received any vaccine. In the case of AMA1, responses were almost exclusively detected with peptides specific for the 3D7 allele, rather than those in common with the FVO allele. This is in contrast to vaccination where the common peptides are better recognized (25), and it may mean that immunization with two alleles can better focus T cell responses on conserved epitopes. In the case of MSP133, responses that were cross-reactive with the Wellcome allele were noted in some volunteers. This is potentially due to conserved sequences between the two dimorphic MSP133 regions, or it potentially represents T cells primed by 3D7 parasite exposure that cross-react with Wellcome allele sequence variants. Given that we had seen no apparent effects in terms of the overall IFN-γ T cell response following vaccination with biallelic Ags, we sought to confirm whether the APL antagonism previously reported by Lee et al. (38) could also be observed in this study in vitro. One pair of previously reported peptides (M7/8) represented minimal class II epitopes that showed APL antagonism. These sequences were contained within our vaccine, and responses were detectable to either one epitope or both in about half of the volunteers tested. Interestingly, and in agreement with the previous data from naturally exposed individuals, this epitope was shown to be convincingly antagonistic in one of seven volunteers who possessed detectable IFN-γ responses. However, when 20-mer peptides were used that contained the minimal epitopes, this antagonistic effect was no longer observed. Furthermore, when minimal epitopes were combined with heterologous 20-mer peptides, antagonism was observed between M7* and M53 but not M8* and M92. The data suggested that the 20-mer peptides could be processed into antagonistic APLs, but also that more optimal HLA binding sequences and/or other epitopes may be present within in the 20-mer in comparison with the minimal peptides. Further testing with larger pools of 20-mer peptides representing both alleles of MSP133 and AMA1 confirmed that there was no overall or obvious effect from antagonism, as measured using this ELISPOT assay readout for either the CD4+ or CD8+ T cell subsets. Neither Ag produced any antagonism in vitro, and responses to the combined allele peptide pools roughly equaled or were slightly greater than those seen to the strongest single allele. This observation was the same for volunteers who had a reduced or equivalent Wellcome MSP133 response as compared with 3D7, indicating that APL antagonism at the time of booster vaccination is unlikely to be contributing to the observed dominance of 3D7 responses. While performing the CD8+ T cell depletion assays, it became apparent that the 3D7 MSP133-specific CD8+ T cell responses were dominant over the Wellcome allele in most volunteers, except those possessing HLA-B*1801. For two volunteers (nos. 1 and 14), who were heterozygous for HLA-B*1801, the 3D7/Wellcome ratio of response was roughly equal, whereas a third volunteer (no. 7) showed a dominant Wellcome response and was the only person homozygous for this HLA type. This observation led us to hypothesize that it was possibly a lack of HLA class I–specific epitopes in the Wellcome MSP133 sequence that may be responsible for the observed difference in immunogenicity between the alleles. We subsequently predicted 12 HLA-B*1801 epitopes, and of these, one showed dominant responses in 3 of 14 volunteers screened, with four other epitopes also showing responses across the same volunteers. These were the three volunteers who possessed HLA-B*1801, and the broadest observed response was seen in the homozygous volunteer. These epitopes are all located close together toward the N terminus of the Wellcome MSP133 fragment and are not present in the 3D7 sequence. Two previous studies (47, 49) have reported that T cell responses to MSP133 are directed to conserved epitopes; however, our data indicate this may not always be the case. Obvious differences exist between the studies, and most notably those related to study of class I versus class II epitopes, as well as host population genetics. Moreover, in the absence of single allele comparator clinical-grade vaccines, we cannot formally exclude the possibility that the observed differences between the 3D7 and Wellcome MSP133 responses are due to immune interference during T cell priming. It remains possible that the presence of the 3D7 MSP133 allele interferes with priming to the Wellcome allele in individuals, except in the case of certain HLA types such as HLA-B*1801. It also remains of interest to assess such vaccine-induced responses in a malaria-endemic target population. A number of studies have characterized HLA types within and between West African, South African (50), and East African populations (51). Focusing on the HLA-B locus, a number of typically African alleles such as HLA-B53 are seen across the populations at high frequencies, whereas other alleles vary in frequency depending on location. HLA-B*1801 was observed as the fifth highest allele frequency (6.21%) in a study in Kenya (51), whereas lower frequencies have been described in West African populations such as The Gambia (5%) and Mali (2.4%), with Europeans at ∼10% (50). Given that 3D7/Wellcome parasite ratios vary in different locations (52–54), a lack of recognition by local HLA types as well as immune interference during coinfection would be of potential advantage to parasites. Similarly, lack of vaccine Ag recognition by local HLA types following vaccination may lead to different levels of vaccine efficacy, highlighting the importance of considering factors such as HLA types when undertaking vaccine field trials. In summary, previous mechanistic studies have concluded that inclusion of multiple alleles of an Ag in a vaccine may be detrimental to both the priming and boosting of T cells. Our data, from human volunteers vaccinated with T cell–inducing viral-vectored vaccines against two different but polymorphic blood-stage malaria Ags, suggest that T cell responses to biallelic Ags can be primed and boosted through vaccination. Following controlled infection with a single P. falciparum strain, vaccine-induced responses did not boost but neither were they apparently immune diverted to the heterologous strain, whereas strain-specific de novo responses could be measured in unvaccinated controls. Responses against the more conserved sequences of MSP1 and AMA1 are evenly distributed across the two alleles; however, for the more divergent regions such as the MSP133 fragment, there does appear to be bias toward the 3D7 allele, most notably for CD8+ T cells. We cannot exclude the possibility that immune interference due to invariant APLs occurred at the time of priming, but we do report a paucity of HLA class I epitopes in the Wellcome allele sequence recognized by United Kingdom volunteers. We could also observe APL antagonism to minimal epitopes in vitro, but this effect did not appear to have a significant impact on the overall Ag-specific IFN-γ T cell response. Although the fine epitope specificity of responses is likely to be important in the context of vaccine-induced immunity, these data suggest host HLA type may more significantly affect the magnitude or breadth of T cell responses. It will therefore remain of interest to further assess in target endemic populations the potential impact of circulating parasite strains, HLA type distributions, and prior malaria exposure on vaccine immunogenicity. A.V.S.H. and S.J.D. are named inventors on patent applications covering malaria-vectored vaccines and immunization regimes. The other authors have no financial conflicts of interest. For clinical and logistical support we thank C. Bateman, M. Smith, J. Meyer, R. Lopez-Ramon, P. Lillie, N. Anagnostou, R. Antrobus, I. Poulton, A. Lawrie, L. Dinsmore, K. Gantlett, R. Sinden, and S. Gilbert (Oxford University, Oxford, U.K.); T. Havelock, C. Grocott, F. Martins, and S. Faust (Wellcome Trust Clinical Research Facility, Southampton, U.K.); and T. Mahungu, R. Singzon, J. Ryu, and T. Doherty (University College London Clinical Research Facility, London, U.K.). We also thank J. Furze, A. Spencer, and D. Worth for laboratory assistance, the Jenner Institute Flow Cytometry Core Facility for technical assistance, S. Colloca, R. Cortese, and A. Nicosia (Okairòs, Rome, Italy) for provision of the ChAd63 vector, and all of the study volunteers. This work was supported by U.K. Medical Research Council Grant G0700735; the European Malaria Vaccine Development Association, a European Commission FP6-funded consortium (Grant LSHP-CT-2007-037506); the U.K. National Institutes of Health Research through the Oxford Biomedical Research Centre; Wellcome Trust Grant 084113/Z/07/Z; and by the European Virtual Institute for Malaria Research, a European Community FP7-funded program (Grant 242095). A.V.S.H. and S.J.D. are Jenner Investigators, and S.J.D. is a U.K. Medical Research Council Career Development Fellow (Grant G1000527). 2011. Vaccines against malaria. Philos. Trans. R. Soc. Lond. B Biol. Sci. 366: 2806–2814.
. 2010. Blood-stage malaria vaccines: recent progress and future challenges. Ann. Trop. Med. Parasitol. 104: 189–211. 2009. The carboxy-terminus of merozoite surface protein 1: structure, specific antibodies and immunity to malaria. Parasitology 136: 1445–1456.
. 2008. Apical membrane antigen 1: a malaria vaccine candidate in review. Trends Parasitol. 24: 74–84.
. 1992. Naturally acquired cellular and humoral immune responses to the major merozoite surface antigen (PfMSP1) of Plasmodium falciparum are associated with reduced malaria morbidity. Parasite Immunol. 14: 321–337.
. 2004. Human antibodies to recombinant protein constructs of Plasmodium falciparum apical membrane antigen 1 (AMA1) and their associations with protection from malaria. Vaccine 23: 718–728.
. 2010. The relationship between anti-merozoite antibodies and incidence of Plasmodium falciparum malaria: a systematic review and meta-analysis. PLoS Med. 7: e1000218.
. 2008. Effective induction of high-titer antibodies by viral vector vaccines. Nat. Med. 14: 819–821.
. 2000. CD4+ T cells acting independently of antibody contribute to protective immunity to Plasmodium chabaudi infection after apical membrane antigen 1 immunization. J. Immunol. 165: 389–396.
. 2012. Recombinant viral-vectored vaccines expressing Plasmodium chabaudi AS apical membrane antigen 1: mechanisms of vaccine-induced blood-stage protection. J. Immunol. 188: 5041–5053.
. 2005. The clinical-grade 42-kilodalton fragment of merozoite surface protein 1 of Plasmodium falciparum strain FVO expressed in Escherichia coli protects Aotus nancymai against challenge with homologous erythrocytic-stage parasites. Infect. Immun. 73: 287–297.
. 2008. 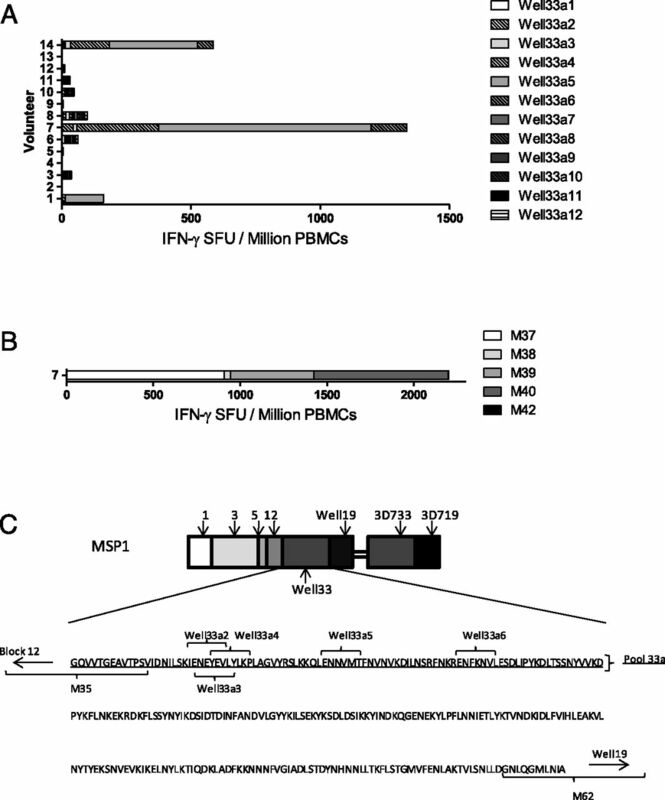 Protection induced by Plasmodium falciparum MSP142 is strain-specific, antigen and adjuvant dependent, and correlates with antibody responses. PLoS ONE 3: e2830.
. 2011. Vaccination with Plasmodium knowlesi AMA1 formulated in the novel adjuvant co-vaccine HT™ protects against blood-stage challenge in rhesus macaques. PLoS ONE 6: e20547.
. 2009. High antibody titer against apical membrane antigen-1 is required to protect against malaria in the Aotus model. PLoS ONE 4: e8138.
. 2011. Defying malaria: arming T cells to halt malaria. Nat. Med. 17: 49–51.
. 2005. Development and regulation of cell-mediated immune responses to the blood stages of malaria: implications for vaccine research. Annu. Rev. Immunol. 23: 69–99.
. 1990. Antibodies that protect humans against Plasmodium falciparum blood stages do not on their own inhibit parasite growth and invasion in vitro, but act in cooperation with monocytes. J. Exp. Med. 172: 1633–1641.
. 2010. Clinical protection from falciparum malaria correlates with neutrophil respiratory bursts induced by merozoites opsonized with human serum antibodies. PLoS ONE 5: e9871.
. 2008. Vaccination with live Plasmodium yoelii blood stage parasites under chloroquine cover induces cross-stage immunity against malaria liver stage. J. Immunol. 181: 8552–8558.
. 2009. Recombinant viral vaccines expressing merozoite surface protein-1 induce antibody- and T cell-mediated multistage protection against malaria. Cell Host Microbe 5: 95–105.
. 2010. Involvement of CD8+ T cells in protective immunity against murine blood-stage infection with Plasmodium yoelii 17XL strain. Eur. J. Immunol. 40: 1053–1061.
. 2010. Prime-boost vectored malaria vaccines: progress and prospects. Hum. Vaccin. 6: 78–83.
. 2010. Viruses as vaccine vectors for infectious diseases and cancer. Nat. Rev. Microbiol. 8: 62–73.
. 2011. Phase Ia clinical evaluation of the Plasmodium falciparum blood-stage antigen MSP1 in ChAd63 and MVA vaccine vectors. Mol. Ther. 19: 2269–2276.
. 2012. Phase Ia clinical evaluation of the safety and immunogenicity of the Plasmodium falciparum blood-stage antigen AMA1 in ChAd63 and MVA vaccine vectors. PLoS ONE 7: e31208.
. 2012. ChAd63-MVA-vectored glood-stage malaria vaccines targeting MSP1 and AMA1: assessment of efficacy against mosquito bite challenge in humans. Mol. Ther. 20: 2355–2368.
. 2011. A field trial to assess a blood-stage malaria vaccine. N. Engl. J. Med. 365: 1004–1013.
. 2010. Phase 1 trial of the Plasmodium falciparum blood stage vaccine MSP1(42)-C1/Alhydrogel with and without CPG 7909 in malaria naïve adults. PLoS ONE 5: e8787.
. 2011. Impact on malaria parasite multiplication rates in infected volunteers of the protein-in-adjuvant vaccine AMA1-C1/Alhydrogel+CPG 7909. PLoS ONE 6: e22271.
. 2009. Humoral immune response to mixed PfAMA1 alleles; multivalent PfAMA1 vaccines induce broad specificity. PLoS ONE 4: e8110.
. 2008. A diversity-covering approach to immunization with Plasmodium falciparum apical membrane antigen 1 induces broader allelic recognition and growth inhibition responses in rabbits. Infect. Immun. 76: 2660–2670.
. 2011. Transgene optimization, immunogenicity and in vitro efficacy of viral vectored vaccines expressing two alleles of Plasmodium falciparum AMA1. PLoS ONE 6: e20977.
. 2010. Enhancing blood-stage malaria subunit vaccine immunogenicity in rhesus macaques by combining adenovirus, poxvirus, and protein-in-adjuvant vaccines. J. Immunol. 185: 7583–7595.
. 2010. New candidate vaccines against blood-stage Plasmodium falciparum malaria: prime-boost immunization regimens incorporating human and simian adenoviral vectors and poxviral vectors expressing an optimized antigen based on merozoite surface protein 1. Infect. Immun. 78: 4601–4612.
. 1987. Allelic dimorphism in a surface antigen gene of the malaria parasite Plasmodium falciparum. J. Mol. Biol. 195: 273–287.
. 1998. Association of malaria parasite population structure, HLA, and immunological antagonism. Science 279: 1173–1177.
. 1999. Altered peptide ligands narrow the repertoire of cellular immune responses by interfering with T-cell priming. Nat. Med. 5: 565–571.
. 2006. Dimorphic Plasmodium falciparum merozoite surface protein-1 epitopes turn off memory T cells and interfere with T cell priming. Eur. J. Immunol. 36: 1168–1178.
. 2001. Identification of frequently recognized dimorphic T-cell epitopes in plasmodium falciparum merozoite surface protein-1 in West and East Africans: lack of correlation of immune recognition and allelic prevalence. Am. J. Trop. Med. Hyg. 64: 194–203.
. 1995. The effects of natural altered peptide ligands on the whole blood cytotoxic T lymphocyte response to human immunodeficiency virus. Eur. J. Immunol. 25: 1927–1931.
. 1997. Impaired induction of cytotoxic T lymphocytes by antagonism of a weak agonist borne by a variant hepatitis C virus epitope. Eur. J. Immunol. 27: 1782–1787.
. 2001. Low CD4+ T cell responses to the C-terminal region of the malaria merozoite surface protein-1 may be attributed to processing within distinct MHC class II pathways. Eur. J. Immunol. 31: 72–81.
. 2003. Analysis of immunological nonresponsiveness to the 19-kilodalton fragment of merozoite surface protein 1 of Plasmodium yoelii: rescue by chemical conjugation to diphtheria toxoid (DT) and enhancement of immunogenicity by prior DT vaccination. Infect. Immun. 71: 5700–5713.
. 2011. Experimental human challenge infections can accelerate clinical malaria vaccine development. Nat. Rev. Immunol. 11: 57–64.
. 2004. Disulfide bonds in merozoite surface protein 1 of the malaria parasite impede efficient antigen processing and affect the in vivo antibody response. Eur. J. Immunol. 34: 639–648.
. 2008. Ex vivo cytokine and memory T cell responses to the 42-kDa fragment of Plasmodium falciparum merozoite surface protein-1 in vaccinated volunteers. J. Immunol. 180: 1451–1461.
. 1997. Characterization of human T- and B-cell epitopes in the C terminus of Plasmodium falciparum merozoite surface protein 1: evidence for poor T-cell recognition of polypeptides with numerous disulfide bonds. Infect. Immun. 65: 3024–3031.
. 1990. The T cell reactivity against the major merozoite protein of Plasmodium falciparum. Immunol. Lett. 25: 143–148.
. 1995. Identification of T and B cell epitopes recognized by humans in the C-terminal 42-kDa domain of the Plasmodium falciparum merozoite surface protein (MSP)-1. J. Immunol. 154: 6022–6030.
. 1992. Interethnic genetic differentiation in Africa: HLA class I antigens in The Gambia. Am. J. Hum. Genet. 50: 411–421.
. 2002. HLA-A and HLA-B in Kenya, Africa: allele frequencies and identification of HLA-B*1567 and HLA-B*4426. Tissue Antigens 59: 370–380.
. 1992. Longitudinal study of Plasmodium falciparum polymorphic antigens in a malaria-endemic population. Infect. Immun. 60: 1122–1127.
. 2007. Dynamics of polymorphism in a malaria vaccine antigen at a vaccine-testing site in Mali. PLoS Med. 4: e93.
. 1991. Genetic diversity of Plasmodium falciparum in a village in eastern Sudan, 1: Diversity of enzymes, 2D-PAGE proteins and antigens. Trans. R. Soc. Trop. Med. Hyg. 85: 572–577.